Industries contributes various kinds of pollutants to the environment. Different countries in the world are facing different types of industrial pollution problems. Industrial pollution has attracted a lot of attention. The industrial sector generates both traditional pollutants (e.g., organic substances, sulphur dioxide, particulates and nutrients) and newly- recognised pollutants (e.g., specific toxic substances). Thus, industry has particular environmental responsibilities in terms of such factors as plant location and design, environmental pollution, vibration and noise controls, waste disposal, occupational health and safety aspects, and long-range planning. This book on industrial pollution and its control summarises various aspects of pollution prevention and waste minimisation aspects in various industries and is divided in two volumes. Volume I contains 1 to 22 chapters and Volume II has 23 to 50 chapters. This book discusses: emissions from particulate matter and its control, industrial wastewater and its treatment, common effluent treatment plant, industrial biotechnology and climate change, pollution control in mechanical, electrical, metallurgical and mining industry, pollution control in cement, ceramic and glass industry, pollution control in chemical process and allied industries, pollution control in sugar, pulp and paper, rubber and plastic industries. 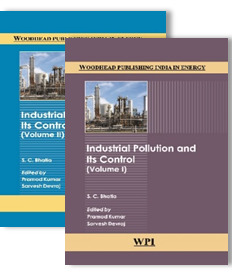 A unique features of the book is chapters on process integration for pollution prevention and energy saving and nanotechnology for industrial pollution prevention.